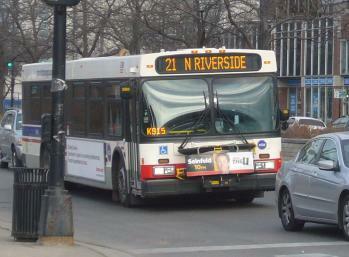 Chicago needs a healthy and growing bus system. Fewer Chicagoans riding the bus means more people driving and more cars on our already congested streets, especially in and around downtown during peak periods. Our hub-and-spoke rail system continues to be a good option for people who live and work along the CTA train lines and in the Loop, but many neighborhoods lack access to it. Without more investment in bus service, Chicago risks more people abandoning transit for transportation options that are more expensive and less efficient, healthy, and green. The report acknowledges that part of the problem has been CTA’s substantial service reductions, but seems mainly to look at “how do we move buses around faster” rather than “how do we provide service that lets people travel where they want, when they want, under civilized conditions and at a reasonable cost.” But, hey, moving buses faster is probably a good start. The report provides three main recommendations: Dedicated bus lanes, traffic signal improvements, and faster boarding. These could all be good things, too, if wisely placed and managed. The idea of dedicated bus lanes seems to irritate auto-dependents and small businesses in affected areas, altho I suppose in theory we could expect faster bus service –> fewer auto-dependents. It would probably be good to have some examples of places where creation of bus lanes was associated with better business conditions (but of course that would mean higher rents, wouldn’t it?). As the report describes, some traffic signal improvements have been done in only a few areas. “The biggest barrier to further implementation of TSP in Chicago is funding.” The report says that in Los Angeles, signals were upgraded to provide bus priority for a cost of less than $48,000 each, and indicates bus speed improvements in the range of 7% to 25% in Chicago. So, consider that it costs at least $100/hour for CTA to operate a bus. If each improvement saves 20 seconds, on average, and a route operates 150 runs each direction (total of 300 trips) per day, that implies 20*300=6000seconds=1.667 bus-hours per day, >$167/day. That’s $60,955/year! Even allowing for lower service levels on weekends and holidays, and assuming that everything costs twice as much when done by Chicago area governments, the operating cost savings resulting from traffic signal priority are far greater than the cost of implementing it. So, if wisely managed, CTA would find this a worthwhile investment, and pay for it from operating funds if necessary. The proposal for faster boarding suggests, first of all, expansion of the prepaid bus boarding areas that CTA is operating in a few places, and second, installing card readers at rear doors and allowing passengers to board and pay there. No figures are provided to evaluate whether this would be another improvement that would pay for itself. The report acknowledges that enforcement could be a sensitive issue. Since all CTA buses are equipped with interior cameras, it would be straightforward to estimate fare evasion route-by-route, and use rear-door boarding only where and when evasion is minimal. Some enforcement would still be needed, I suppose, but politically-correct guidelines could be used. (1) Create a plan for Transit Priority Streets with 50 miles of dedicated bus lanes. Of course this will face local opposition, at least until the public is persuaded that transit in Chicago is competently managed and wisely planned, but I suppose it might be helpful if it can be done. (2) Create effective ways to enforce bus lanes. This seems to mean getting the Illinois Legislature to approve photo-enforcement of bus lane violations. It probably can be done if the vendors of photo-enforcement equipment can place appropriate bribes, but there will be difficulties. It seems to me that cameras already mounted on buses could be used, with the result that tickets would be issued only when actual buses have been delayed. This would allow for quick stops when no buses are in sight. It would also be cheaper, so bribe money would probably have to come from purchase of hardware or software upgrades. (3) Incentivize purchase of multi-day passes. CTA substantially increased pass prices (relative to single fares) in 2013, and BACK ON THE BUS suggests that the revenue impact of these changes ought to be evaluated. (It’s distressing to think that this evaluation has not been done.) They also suggest consideration of “’fare capping,’ which prevents riders from spending more on multiple single ride passes than they would have if they had purchased a daily [or multi-day?] or monthly pass.” Which seems like a good idea to me, but, again, revenue and ridership impacts would have to be evaluated. The final part of this item is a proposal to ” require Chicagoland companies with 25 or more employees to offer the transit benefit program.” Which makes one wonder why they all don’t participate now. (4) Establish a local dedicated revenue stream to fund transit operations, improvements, and expansion. This might be the main point of the report. Improvements cost money, and BACK ON THE BUS pretends that they can’t be cost-effective, so more money is needed. The existing RTA sales tax would seem to be this revenue stream, but that apparently is insufficient. BACK ON THE BUS cites approvingly the “Transit TIF for the Red Purple Modernization project.” The report doesn’t bother to note that this TIF takes all assessed value increases over the next 30 years in the affected area — leaving nothing for regular government services such as water, sewer, garbage pickup, street maintenance, emergency services, schools, libraries, etc. When these functions ask for money, they will have to get it from tax increases, or more new taxes. (5) Push for more data sharing and analysis of ride-hailing trips. This seems to be a good idea. The need to anonymize the data is noted, but not addressed in detail. What about planning & operations? Why did “we” spend $300 million to rearrange tracks and build new platforms at the Wilson Red Line station. It was an old station and needed reconstruction, but already had a wide center platform with an existing elevator shaft. I am confident that a replacement in kind could have been built quicker and at half the cost, causing fewer delays and serving the riders at least as well as what we are getting now. Why can’t the existing Metra Electric service be improved and coordinated with CTA and Pace schedules (and fares! ), so that southsiders can take advantage of infrastructure and rolling stock that “we” have already paid for, getting a faster and more comfortable trip. By routing Pace and CTA buses to Metra rather than 95th Street, bus operating costs will drop and there’ll be no need for the Red Line extension. Why can’t CTA themselves coordinate their own services? The example I’m most familiar with is Howard Terminal, where arriving Red Line trains are often held out of the terminal to allow Purple and Yellow Line trains to depart, which causes passengers to miss their connections. Of course, holding the trains also causes passengers to miss bus connections. Somewhat similar lack of coordination is seen at many CTA bus terminals. A graph on page 2 (the fifth page) shows CTA average bus speeds dropping from 9.83 mph in 2007 to 9.03 mph in 2015. It would be fascinating to know more detail. My first guess is that, as evening and overnight service has been cut, a greater percentage of buses are operating in congested conditions. I wonder how the chart would look if only peak-hour service and speeds were represented. I hadn’t heard of Transitcenter, the New York – based organization which funded preparation of this report. They seem to be involved in some interesting work.